Caretaker boss Dean Austin is a huge fan of teenage talent Joe Iaciofano and believes the striker is a genuine ‘fox in the box’, but says he is not ready to step up to and solve the first team’s goalscoring crisis. With Town having scored just five goals in their past 10 Sky Bet League One fixtures, a run of games that has seen the team struggle for four draws and six defeats, many supporters have been wondering if Iaciofano could be given a chance to impress. Currently on loan at the Cobblers’ National League North neighbours Brackley, the 19-year-old enjoyed a prolific spell in the Southern League earlier in the season, rattling in 17 goals in 22 appearances for Chesham. Austin is a big admirer of the Town youth team product, and has nothing but praise for the youngster, but he says it would be unfair to expect him to make the big jump into the Cobblers first team and start scoring goals as they try to save their league one skins. The Town caretaker boss has worked closely with Iaciofano since joining the club in September. 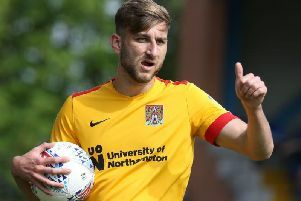 He is monitoring the Northampton-born player’s progress closely, but he feels Iaciofano, and the club in the long term, is going to be served better with him learning his trade down the A43 at Brackley, under the watchful eye of former Cobblers striker Kevin Wilkin. With Town preparing for Saturday’s crunch relegation clash at Bury, Austin was asked if there is any chance of the teenager being recalled for the final games of the season, and he outlined the reasons why that won’t be happening. “Jimmy (Floyd Hasselbaink) wanted Joe out because he needed experience, we don’t have an under-23s, and he needed to play. “I will be bluntly honest here, and Joe knows this, he has a lot of work to do on his game with regards to getting to the level we are at now. “The biggest thing Joe needs at the minute is experience, he needs to go out and play, and get games under his belt. “He has gone out to the Southern League, and has done fantastically well and I went and watched him play. “The level was not very good, and that is not a criticism of Joe, because he went in there and tore it up, he was brilliant. “He went on a run and scored nine in seven or nine in eight, and did really well. “Then he got an injury, and it was a bad one where he did his ankle and he was out for a long time. “The loan was finishing anyway so it finished, and Joe is now playing catch-up. “We have no under-23s, he is only training, and we are trying to get him as fit as we can and he has now gone to Brackley, and has to work his way into Brackley’s team. “That is National League North, and he is only getting 15 minutes at a time at the moment, and we are three levels up from that. “Our squad is at the numbers I want to be working with, and Joe comes in and I have had him in for the past three weeks, even for the two before Jimmy departed. “Every session, where I used to take the players that weren’t in the squad, I had Joe playing every day with us because I am trying to teach him the game, and to try and improve the things he needs to improve on. “Joe is a great kid and he works his socks off every single day, but he knows, and we have spoken about the improvements he needs to make. “Having said that, he is a fox in the box, and at times he is a scruffy finisher and looking at it, we need one of those in terms of when a defender tries to clear the ball it rebounds off his backside and goes in the net. “We need a little bit of that luck at the minute, and that is where he is, but at the moment he is better off being out on loan because there is no point him sitting around here and being 19th man, or 20th man. “From the club’s point of view, I would rather he was out getting the experience so that in the summer he comes back in pre-season he comes back in and is ready to go. “He will have experienced some proper men’s football, been knocked about a little bit, and that experience will be invaluable for him. “It is muck and bullets football at its best, and it will be good for the club and for Joe in the long run, and he has got a chance (of making it).